Lesson from Greece: Money Only Has the Power We Project on to It – Living in Cyn | Y.o.g.a. So last week in European media, there has been a great deal of discussion about the “Greece” Bailout. I’m not sure how much play this news is getting in the U.S., but I think it’s probably not getting as much play as it should. I am also not sure how much attention this theme is getting in “other dimensional” media (among spiritualists and those gearing up for the Ascension). I am no economist, nor am I a financial specialist, but I do believe some things don’t require a degree for complete understanding. Here’s the skinny as I have understood it: the European Union (EU) gave Greece a massive loan and Greece missed its first deadline: June 30. Mind you, Greece has been warning her lenders, the EU and the International Monetary Fund (IMF), that payment wouldn’t be forthcoming. The talks leading up to the now-lapsed payment date were basically a standoff, with Greece saying she couldn’t pay and wanted an extension along with new terms and the EU (mainly Germany and France) saying, “fork it over”. If the absurdity of such “negotiations” didn’t strike you last month, surely it’s beginning to show its true face now that the deadline has lapsed. Some parties are willing to discuss an extension (funny, since the extension is already now in play) and others are talking complete relief (no payment) for Greece. The whole gammut. Could “the People” Save the Day with IndieGogo? Then, there’s this 29-year-old in England who hatched up an IndieGoGo campaign to raise the 1.6 Bn Euro for Greece and help her make good on her loan. And he’s gotten quite a bit of press on this side of the Atlantic. 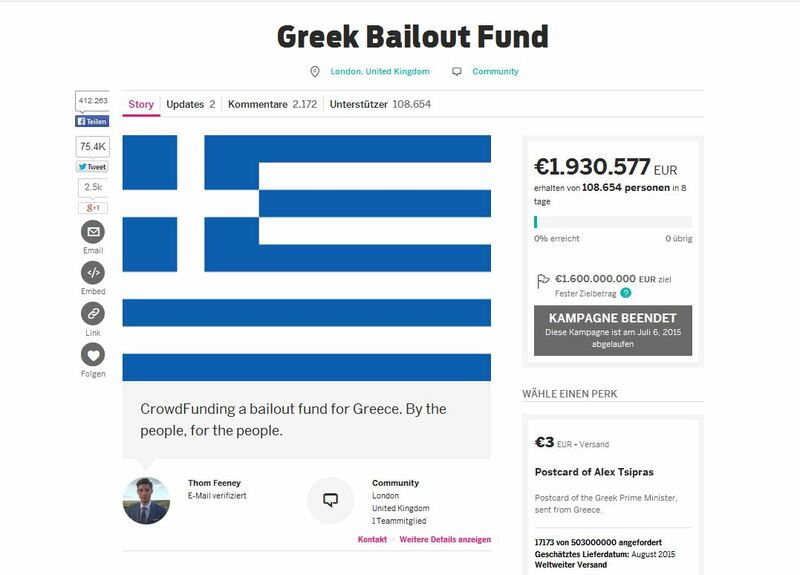 The short version of his premise is basically, if every resident in the EU donated the equivalent of the price of a Greek Salad (about 7 Euro), we could raise the 1.6 Bn Euro that Greece needs to pay back the loan. How “Small” are the Little People? It takes the control and manipulation of the inter-governmental banking system out of the hands of elite politicians and puts it directly in the hands of the people. – Unemployment in Greece last month was as high as ever/always. Those who still have jobs and continue to live there have had to reduce their income by about 70 percent. Many have emigrated to other EU countries, and many more are considering it. – If there are Greeks who are lucky enough to have some money in the bank, they were punished for their government’s mishandling of its funds. Banks shuttered their doors to their customers and nationwide placed a 60 Euro per day limit on their residents’ withdrawal limit. Because — let’s consider this carefully — Greece took a loan because it needed funding to presumably pump back into her economy, so that her economy could experience a boost and raise the funds to pay back her loan. And, yet, over all these years, it seems that the benefit to the Greek people has been, well, has their really been a benefit to receiving this loan? Seeing the IndieGogo campaign had me thinking that this really would be an interesting solution — not so much because it would help Greek politicians save face at the EU negotiating table, but more so because I think it would embolden people — regular people — to better understand their role / our role in the world economy. Money / Currency has only the power we attribute to it.